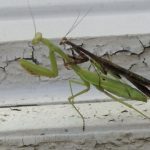 The Carolina mantis (Stagmomantis carolina) is a mantis species native to North Carolina and South Carolina in the United States. Hence the name. 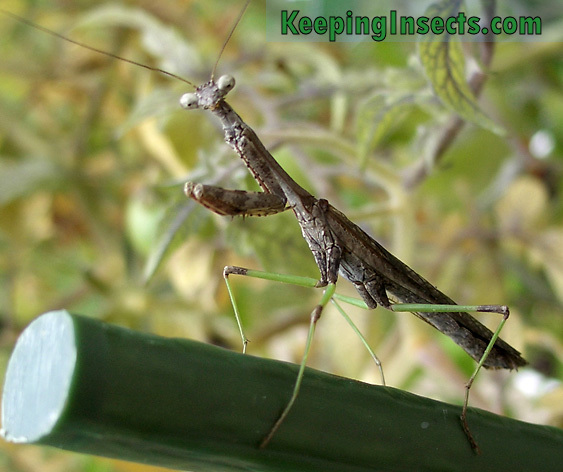 But, actually it is a common mantis is most states of the United States and also occurs in Mexico and South America. The male and female Carolina mantis (Stagmomantis carolina) look very different from one another. The adult female has short wings and is big and heavy. The male has long wings and is small, light and active. The male is able to fly and will do so readily, but the female is unable to fly. 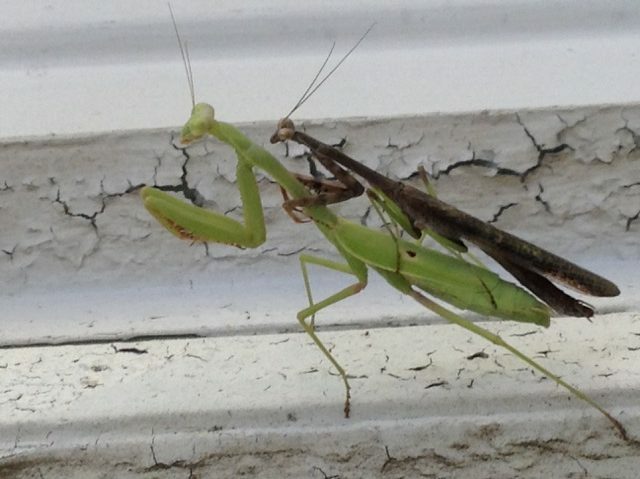 Adult female Carolina mantis. 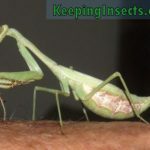 Notice the short wings and the difference in body size with the male Carolina mantis. 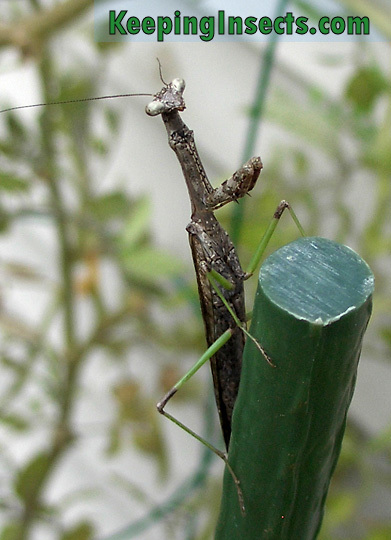 It can be hard to be sure which mantis species you found in your garden. 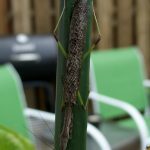 Maybe it’s a Carolina mantis? If you live in the natural distribution area of the Carolina mantis, e.g. the USA, Mexico or South America you at least know it’s possible. 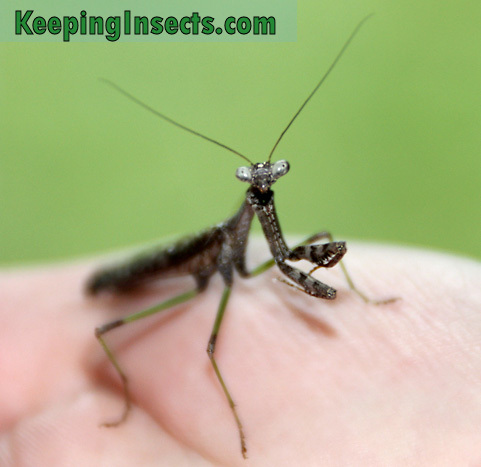 If you found an adult mantis, you are lucky because it is much easier to determine the species of an adult mantis. 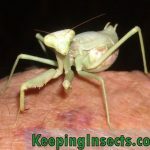 An adult Carolina mantis has wings and has a brown or green body. The color an differ a lot depending on the conditions the mantis was living in. 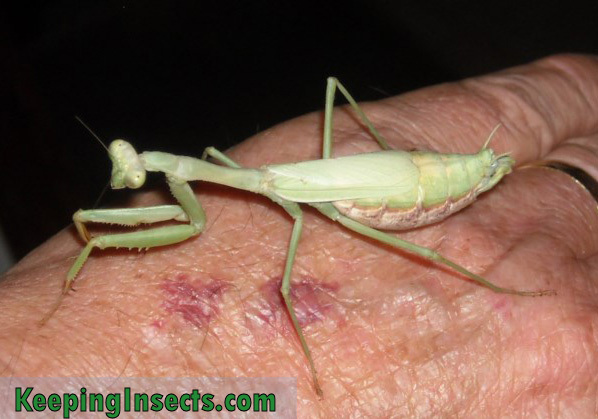 If you have a male Carolina mantis, it has long wings, is very active and has a narrow body. It’s around 4,5 cm in length. If you have a female adult Carolina mantis, it has short wings that do not reach the end of her body. Her body and especially abdomen is very big and bulky. An adult female Carolina mantis is around 5 to 6 cm in length. 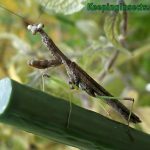 Both Carolina mantis sexes look like the more “stereotypical mantis”, without any camouflage body appendages like fake leaf-structures. It’s body plan is straightforward and streamlined and all camouflage comes from its body color and pattern. Mating Carolina mantis pair. Picture by Michael Schenk. On this picture you see the short wings of the female Carolina mantis. 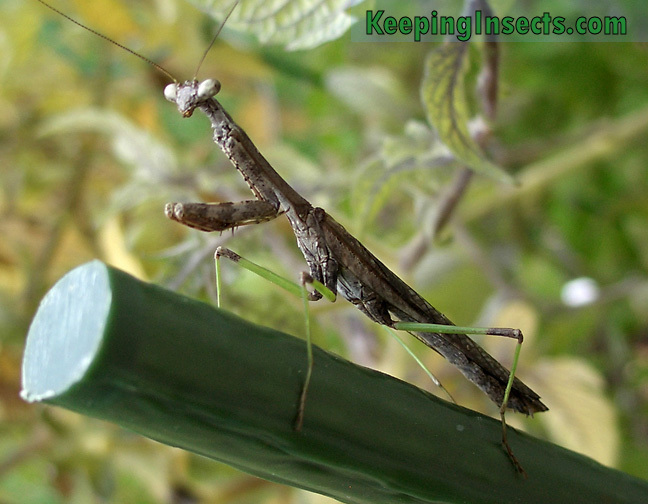 Only adult mantises have wings, and generally only the males use them to fly. From this picture it’s obvious why the female cannot use her wings to fly! 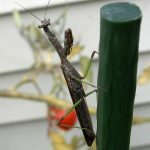 Maybe you found a Carolina mantis in your garden and want too keep it as a pet. 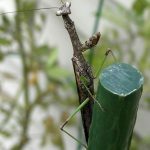 If possible I would say you can enjoy your mantis in the garden too, as female mantids are often very inactive if they get enough prey. So if you feed it in the plant were it lives, it will probably stay there. Males do not stay in the same spot for long. If you do want to keep a Carolina mantis indoors, make sure you take good care of it. 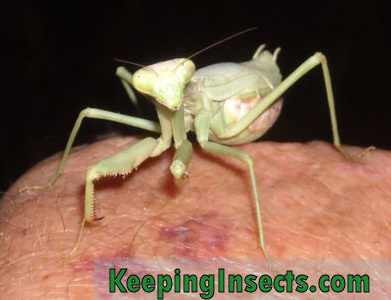 You can read all about general mantis care here. For a Carolina mantis you don’t need special equipment. 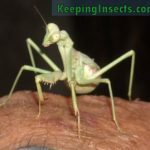 Keep the enclosure at room temperature (19 to 22 degrees Celsius) or temperatures that sort of match the temperature where you found the mantis in nature. Mist the cage twice a week with water from a plant watering spray bottle. 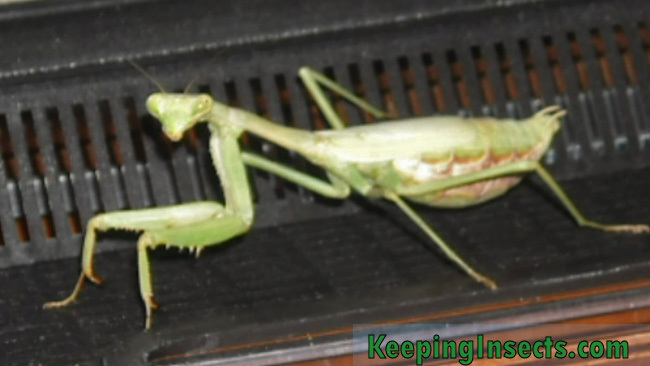 This increases air humidity and allows your mantis to drink if needed. 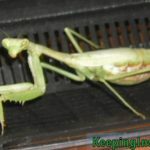 Feed your Carolina mantis houseflies, moths, crickets, small grasshoppers, small cockroaches or fruit flies. The female can get extremely fat, it is wise to limit her eating when she is really big because it can be hard for her to move. 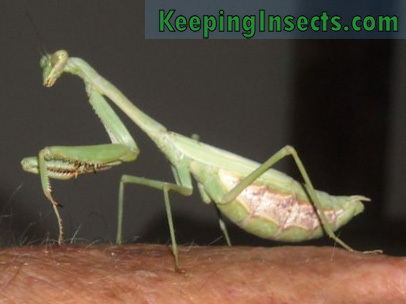 In nature mantids will go days without food because sometimes they just don’t manage to find prey. 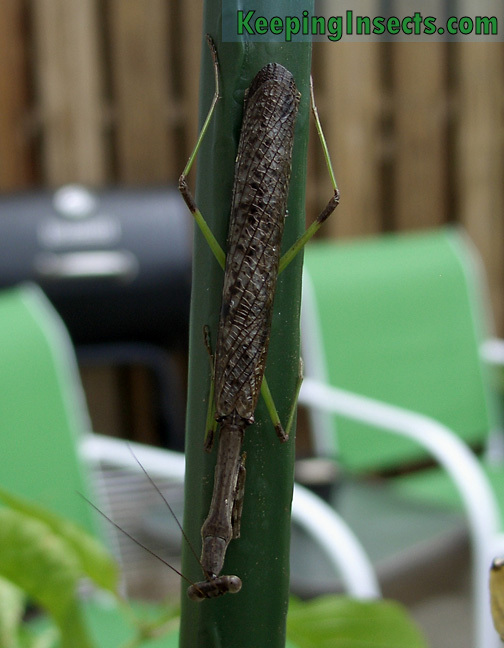 A adult male Carolina mantis. 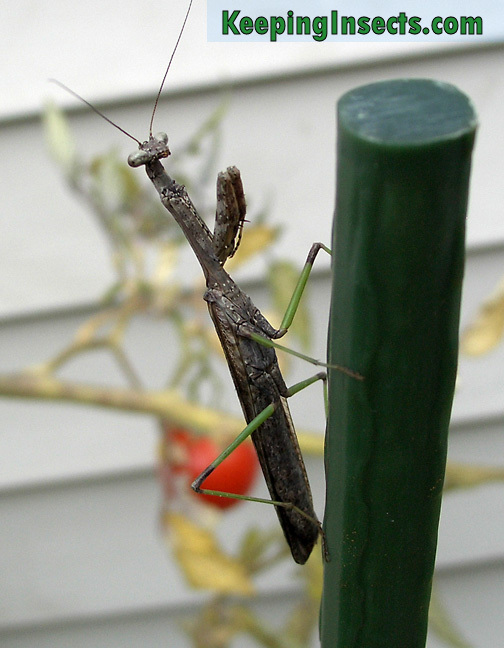 In fall, around end of September and October, the female Carolina mantises will start to lay eggs. Mantids make egg sacs called ootheca. This is a foam pouch which contains the eggs. The foam gets very hard and protects the eggs. Inside a Carolina mantis ooth are around 20 to 40 eggs. A female can lay more than one ootheca and if she mated once in her life, all eggs will be fertilized. 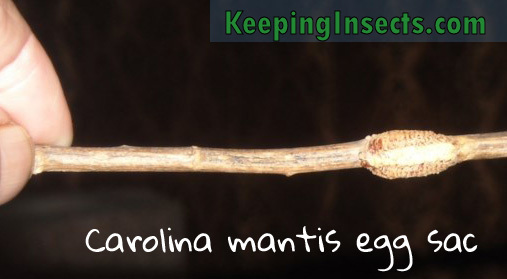 If you find a Carolina mantis ootheca in nature you can better leave it where it is. Next spring the mantis nymphs will hatch, even if the winter was a bit harsh. 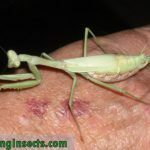 if you have a Carolina mantis egg sac from your pet mantis you can keep it at room temperature to have it hatch soon (6 to 8 weeks). If you want the eggs to hatch in spring, you need to keep the ootheca cool by placing it in your basement, attic or garden house. In spring you can place it at room temperature or outside to let the eggs develop and have the mantis nymphs hatch. The pictures of the male Carolina mantis are made by Robert Smith from West Virginia USA. The pictures of the female are made by Michael from Oklahoma City, USA. I’m happy and grateful I could use them on this website.